The last time we talked about Robovie, we mentioned that he looked like he was ready to take over all of us fleshy humans. 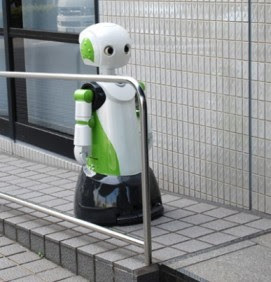 It would appear that Robovie-R, a robot that is designed to assist the elderly, has been upgraded to Version 3 which now stands 120 cm tall and weighs 43 kg. Sorry we don’t have more information about the mouth robot, here is some more specs about the Robovie. It has eleven touch sensors, two USB cameras (one for each eye), two mono mics (one for each ear) 17 joints, a speaker in the mouth, networking capability, and can travel 2.5 km per hour. We think it is proof that robots are getting more human all the time. In fact, let’s combine the mouth with the body of the Robovie. Or maybe we should just stick with the speaker on the mouth, as the robo-mouth just freaks me out. Sorry if we can’t get over that mouth-bot. It just looks like something from The City of Lost Children or something. However, that Robovie could assist the elderly, and that’s good, right?